Today is Moonnam Onam (3rd Onam) and the Malayalam star (nakshathram) is Avittam. No more pookkalams and the season of Onam would have been over for me, if not for the 12 more alphabets! Talking about sadya, no doubt you will agree with me that the Sadya is indeed heavy! You start off with rice and dal and a whole lot of variety of side dishes. You dig your way through more rice served with sambar, followed by rasam and a second/third round of the side dishes. And then comes the yummy range of payasams (remember – there might be 3 or 4 payasams served in some places) and by now your stomach will be full and ready to burst. So the last round is the simplest one and the best one for your by now heavy, heavy stomach. 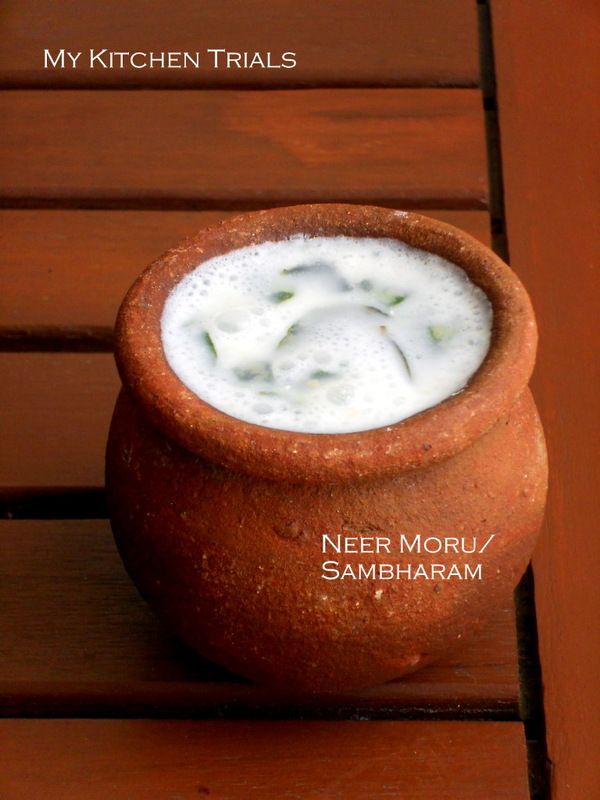 Its moru/sambharam or neer moru as its called in Tamil Nadu. (A bit of cheating again, I really didn’t want to make a Naranga(lemon)/Nellika(gooseberry) pickle for the letter ‘N’). After the payasam round, a little bit of rice is served to have with moru. If you are too full to eat rice any more, have it in a glass and wash down your meals with it. 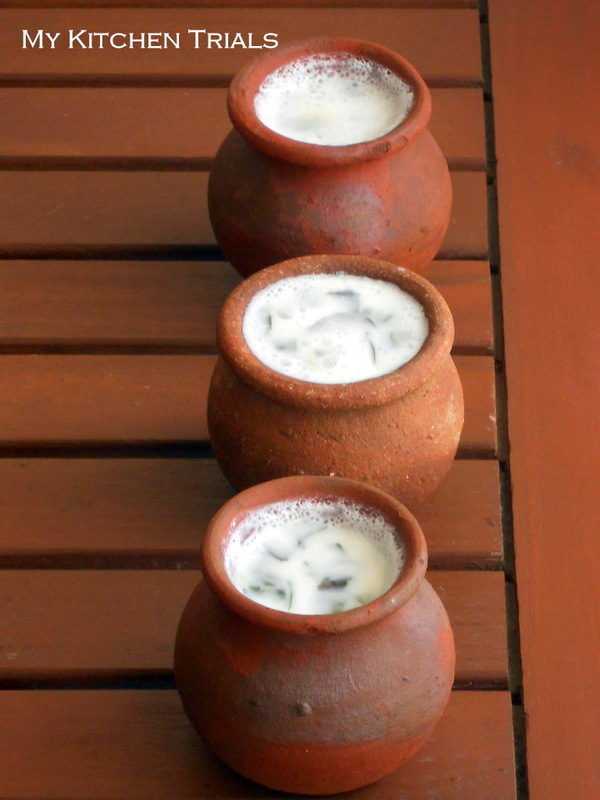 The sweet taste and heaviness of the payasam(s) get compensated by the salty, spicy taste of the buttermilk. Everything in there is helpful for digestion(ginger, hing etc.) and you will feel much lighter after that! For my sadya, I went ahead with the yogurt than buttermilk since I was short on time. But let that not stop you from making this drink at your home. Make it and drink it any time of the day, any time of the year. Its the perfect summer drink and its natural and the best! This recipe is just a guideline, you need to adjust the water proportion, salt and spice according to your preference. You can add pepper also when blending the buttermilk. Other additions would be finely chopped sambar onions (don’t blend this), coriander leaves, lemon/lime leaves, roasted jeera powder etc. My regular sambharam has just salt, pepper and hing (kayam/asafoetida) in it. Grind the chillies, curry leaves and ginger in a mixie. 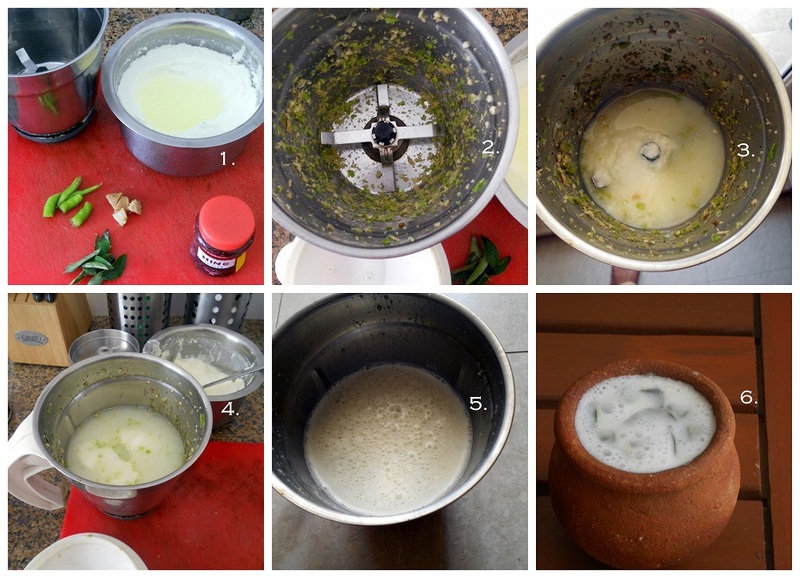 This mix can be stored in a small dabba and can be mixed with curd, water and salt to make butter milk easily. Add curd and water and blend until its frothy. Add salt and hing. Blend again and taste test. Adjust seasoning and serve as the last course with rice or as a digestive drink at the end of the meal. 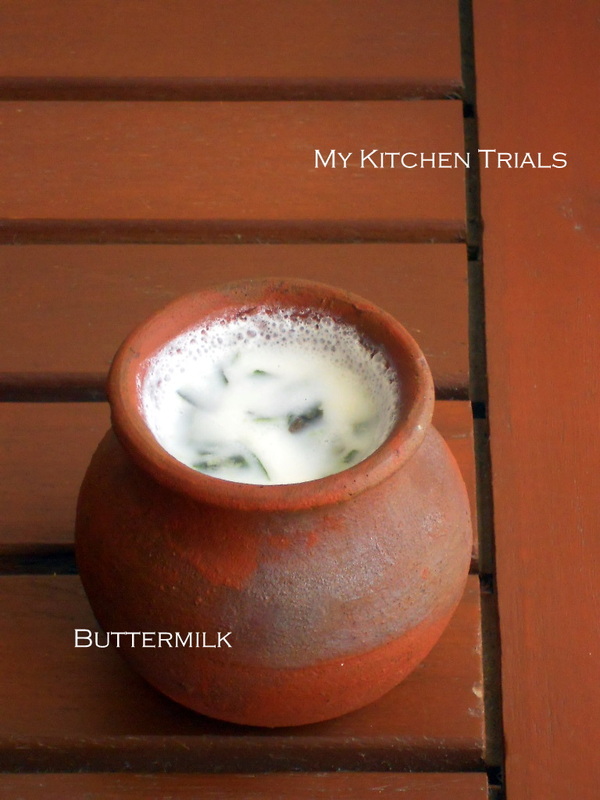 Such a refreshing & flavorful buttermilk. Great way to wash down the heavy meal.. Love your little matkis. love the prop I like this recipe very much can have it with rice everyday. Very flavourful n super refreshing neer moru, those lil matkis are damn cute. The most refreshing drink ever. We call it Mattha in Marathi. I can drink glasses and glasses of it. super refreshing and super soothing!! Nothing to beat this Rajani, loved reading the post! Love the pot..brings back memories from my childhood when we used to have buttermilk in those matkis!! Wow what a lovely post. I was quite full with all those dishes I have been drooling on. This is amazing an I am now sure when you said in the discussion yesterday about focus. Thanks Rajani.